Do you need a 2nd controller for your VECTREX? Did you pick up a VECTREX without controller? Did you look on ebay and find none? Did you find one, but it was quite pricey? 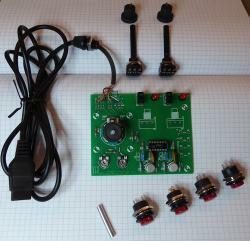 Have you always wanted to make a better controller, but it was just to much work to do? This could be a solution! 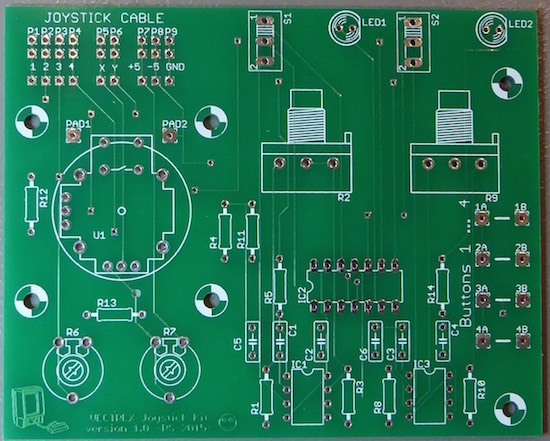 I've been making a new controller PCB for VECTREX. Finish panel and housing. Mount the PCB into the housing. Connect and solder button cables. Connect and solder potentiometer cables. All electrical connections are already there. The mechanical problem of attaching the controller stick is already solved. You'll save a lot of time! You don't have to care for electronic circuitry. You don't have to search components. No ordering this part here and that component there. No separate shipping costs for all those extra components. I can provide only a limited number to the community. I cannot build your complete controller. You have to have some basic manual skills. This is a kit. I do have no shop and I'm running no company. This is just a little spare time hobby project. Not more. At the moment I do have eight spare PCBs and components. If there should be some demand, I'm going to do another production run and I will try to order components in larger amounts, which reduces component and shipping cost. All in all, something like 55€. Well and that is without getting rich, just my own expenses. I could cancel the expensive arcade buttons to cut cost by some 25 percent on my side, but I would not recommend any cheap pushbuttons instead. Simply doesn't make sense. If you have some interest or want to know something, just PM me. I presume shipping on the kits wouldn't be too expensive either? Maybe some enterprising American could import a batch and put them together over here... Almost every Vectrex out there can probably use at least one. I'll bet there would be enough demand that the importer/assembler could make a little profit, and you might be able to recover more costs or maybe even make some money too... (you might ask EDLADDIN, he might be interested in doing that since he made Atari 7800 controllers and probably knows how to do it quickly and efficiently). Yes, I'm interested. Looks cool. What are the dimensions of the PCB? I'm concerned about two things, that the PCB is too big in the smaller direction and that the analog stick might break from the board under heavy use. Edited by djmips, Wed Jul 15, 2015 12:53 AM. No, I don't think so. I have shipped things like that around the world for something like 8 Euros. Maybe leaving out four bulky buttons would be interesting in that respect. On the other hand, ordering them separately in your own country will cost extra money, too. Maybe it would be easiest, if you just told me, what you need and what you don't need. I could adjust the total price to your order anytime. Maybe some enterprising American could import a batch and put them together over here... Almost every Vectrex out there can probably use at least one. Yes, € means "Euro" . I had the same feeling, back in the day, they introduced it. Well, you know, I'm not sure how many people really will be interested. It's not a finished product, which will scare off a lot of people, I suppose. We'll see. Maybe it's going to be just a couple of orders. 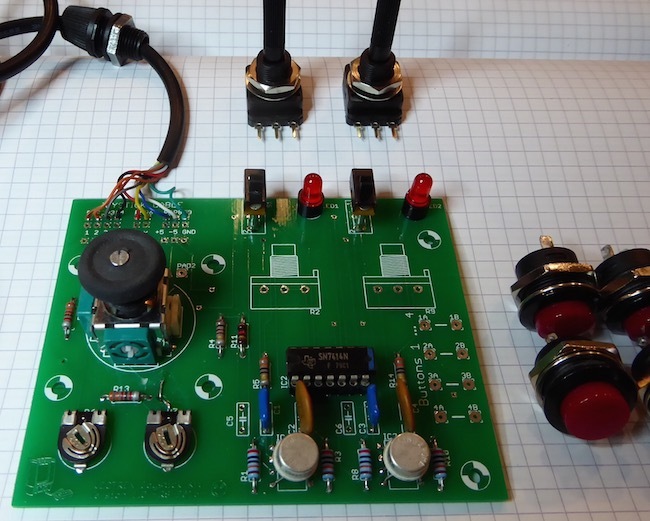 The most expensive components really are the buttons, the knobs and the analog controller. It's not easy to reduce costs there, without changing to cheap crappy parts (which you get easily on the web). Dimensions are 8 cm x 10 cm (= 80 mm x 100 mm). Yeah, again those funny metric things . You see the gridded paper on the photo? That's a 5 mm grid. You'll need quite a large housing for all those buttons and knobs, I'm afraid. 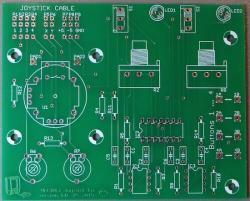 The dimensions of the PCB shouldn't be a real problem. It's a good idea to reduce the size/length of the lever or the thumb-stick to limit physical forces on the controller. The controller itself is attached via four "massive" soldered pins at the corners. The PCB provides four mounting-holes at the corners. I think that should withstand occurring forces - hopefully. I believe, industrial manufactured controllers work the same(?). Edited by Rolo, Wed Jul 15, 2015 6:08 AM. Just look for a housing you like. I think I would make a 3D printed enclosure. Probably design it around the original. OK, I'm getting it now, it's really more of a Street Fighter arcade stick style that this is suited for rather than something you hold in your hand. That's cool too! Great to see another analogue controller option around! Thanks ! You're on "the list". Please have some patience. Not all components have already been delivered. The whole process is not already well established. I'm climbing up the learning curve - I try. I've been trying to figure out the best way, to attach the PCB to a panel or top of a housing. I still don't have the buttons. The holes for the buttons will be 4 mm wider, than shown on the picture. And, of course, the dimensions of the panel can be reduced. It's just a mock-up. What do you think of positioning the buttons like that: 1 & 2 upper row, 3 & 4 (auto firing) lower row? My fingers often lose orientation with four buttons in one row. I think,I'm going to use longer distance rollers to gain some space for the thumb stick cap. I have to find the right size for the hole in the panel. Maybe I'm going to split the PCB into two parts, which means extra soldering and extra cost, but on the other hand, more flexibility arranging those within a case. @Richard H.: Do want to make it a plastic case? Do you think, it will be solid and stable enough? We know it all, during gameplay we are pushing and pulling the thing like mad. I once accidentally broke a transparent Competition Pro in my hand. The transparent plastic was not as solid as the black plastic. What are the estimated costs involved for a printed housing? Edited by Rolo, Sun Jul 19, 2015 12:11 PM. @Richard H.: Do want to make it a plastic case? If it was me, I would have everything on the board (i.e. 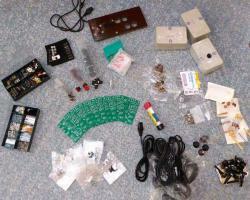 the buttons, DB9 socket etc). It would make it so easy to just snap it into a case (no wiring required). Of course, the case can be made around the PCB (the beauty of 3D printing). Do you think, it will be solid and stable enough? Definitely. ABS printed without infill is very strong. But there's also all kinds of other stuff (PET, HIP, nylon, carbon fibre etc). Low cost on an FDM printer with ABS. Small quantities of course. I'm also interested. do the potentiometers also work as paddle controllers? No. No Z-axis, just X and Y. Do we have any paddle-style games on the Vectrex, where we need that? X and Y are both analog, so KABOOM-like games are working fine. Hmmm, additional rotary potentiometers for both axis could easily be built in. And switches to toggle between controls. Could be a somewhat crowded controller in the end. Well, what do other people think? Is this something, which should be pursued? What's going on with the Controller? A lot of logistics involved, even with such a small project. At the moment I'm looking for parts, I'm comparing, emailing, ordering, doing some preparations and tests. I still don't have the buttons. I ordered them two weeks ago, but it takes some time until they arrive from Japan. Nobody seems to have sufficient supply in this part of the world. But there are so many thing stop do, like adapting the plugs, testing various knobs, thinking about improvements, soldering ... I'm not getting bored . It's going to take some time until I'll finally will be able to deliver. I've got the names of interessted people on my list and will keep them informed, unless they write me, they have changed their minds and don't want that anymore. Can I be added to the list for this kit? .. Is the thumbstick determined to be kind of like the Playstation ones, or is that metal rod in the first picture for that, (more like the Vectrex original)? Ooops, didn't see you . Sure, you're on the list. I think there are a few items left... But it's still going to take some time. I'm not completely ready, yet. I'm trying different types of levers at the moment: standard plastic or aluminum thumbsticks, aluminum rollers and 3D-printed plastic Vertex-like sticks. I'm not sure, which one's going to work best. Maybe I can offer variations. I will post any major progress in this thread. Not sure if this would be compatible with your PCB. Also their stock is dwindling. I haven't tried this yet nor have any experience, but i'd look into it if you had a printable file on hand. Edited by gliptitude, Fri Aug 7, 2015 10:52 PM. I found the exact part that George uses for his joystick mechanism but they do not come with potentiometers and I haven't tried to figure anything out yet. Incidentally, the joysticks for the Equinox and Yeti are the same. The mechanical component could be interesting, since you can mount any potentiometer value into it (for other systems), but they only have 4 in stock. I don't think that those components are produced anymore. Concerning the levers, I'll get a prototype of my own design printed shortly. If that's working, I can get a limited number of those. If I need more, I would try to find another source nearby. There must be some local place, where I can get 3D-prints. The shaft of the ALPS controller stick I'm using is quite special. Not sure if the red ebay-parts would be fitting. I found some aluminum thumbsticks on ebay which are working quite nicely. In the meantime, I've ordered a big box full of red 24mm-buttons directly from Japan. They are supposed to arrive within three weeks. This proved to be easier, cheaper and probably quicker, than buying them in my country. Futhermore I ordered another ten joystick extension cables. I've modded five connectors until now. 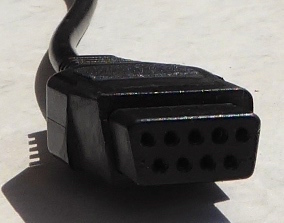 The dimensions of the upper part of the connectors have to be reduced to make them fit into the Vectrex's outlet. I will connect the auto-fire switches with short cables, in a way, that you can rearrange the positions within a certain range. I think, I will not solder in the two potentiometers, the four buttons, and the controller cables, since I do not know your plans and designs. It's not too much work to do - and remember, it's a kit!